Do you compost? Have you ever tried? It is really easy and apart from being very eco-chic it one of the best things you can do for your garden. Like most things, commercial compost just isn’t the same as that which you make yourself. The reason why is because the bags you pay Lowe’s mucho dinero for are generally based around a single material, such as mushroom compost or animal manure. The diversity of nutrients just isn’t present and your garden will show the difference. Homemade compost is made up of so many different base ‘ingredients’; lawn clippings, shredded newspapers, mouldy veges you’ve left in the bottom of the fridge for too long, spent coffee grounds and dead tea bags. Each ingredient brings a different set of nutrients to your compost mix evolving over time to become the perfect, richly complex, blend for your garden just as nature intended. Compost harvest is a pretty exciting time. Look what we made and all from stuff that normally gets thrown away! It is the epitome of recycling. Today’s compost harvest ready for the vege garden. Air – composting is a natural process, one which relies on bacteria and microbes to do the ‘breaking down’ for you. These friendly little guys all need air to do their job. A good compost pile needs to be fluffy with pockets of air throughout. Turning a pile which has compressed and gone flat will refluff the pile and get the process going. Water – the microbes need water, too. But there’s a catch! Too much will make the pile soggy and leave a stinky nasty mess. Too little will slow the decomposition process or stop it all together (there’s a reason mummies have survived in the dry desert for so long). Just like Goldilocks you need just the right amount. Carbon – often referred to as ‘browns’. The little microbe-y guys use carbon as a source of energy which can be found in just about anything that was once alive but now dead, like fallen leaves, shredded newspaper, torn up cardboard boxes, egg cartons and straw. Guinea pig bedding makes great composting browns, too. Nitrogen – generally green, plant matter. Nitrogen provides the proteins the microbes need to build their little bodies and can be found in things like kitchen scraps, lawn clippings and animal manures. C:N ratio – broadly speaking, you need twice as many carbon materials to nitrogen materials to have a happy compost pile. Time – mother nature does her best when she is not rushed. Now, I know this sounds complicated but it really isn’t. I mean, entire dinosaurs disappeared back into the earth eventually! You just can’t get it wrong. Whatever you do to your compost pile, regardless of the ‘rules,’ it will eventually turn in to Black Gold if given enough time. I have two tumbler bins that I use to make compost. Here’s what my set-up looks like. I bought both bins second hand on Craig’s List – score! I like the tumblers because it takes a lot of the yucky parts and work out of the composting process. The closed system prevents critters from digging around in the pile looking for snacks and the work of turning the piles is as simple as a quick spin around the axel. Easy. 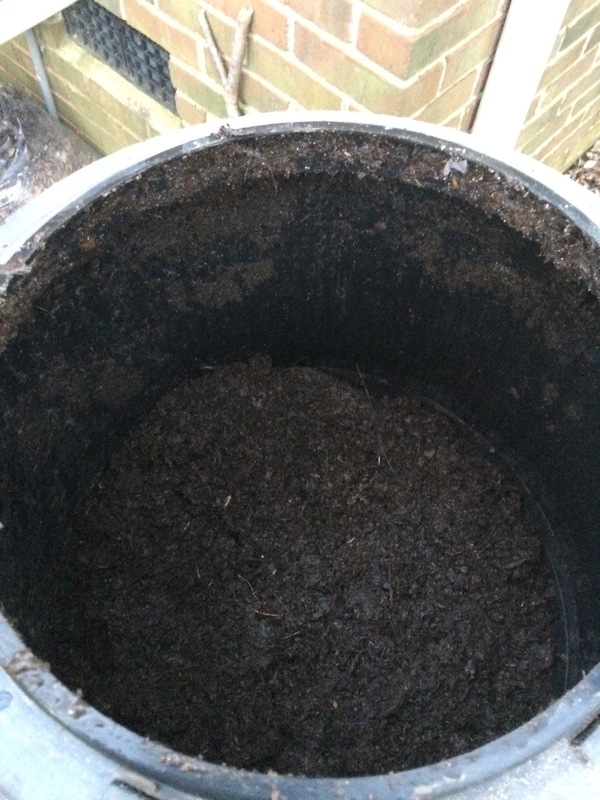 You know your compost is ready when you can’t recognise anything that went in to make it. The Halloween pumpkins, egg shells, and bags of lawn and leaf clippings have all magically turned in to the most fertile, healthy, rich loam from sun drenched Tunscan hillsides you can ever imagine. It doesn’t smell of anything much, just sweetly earthy. Definitely not offensive. Black Gold. 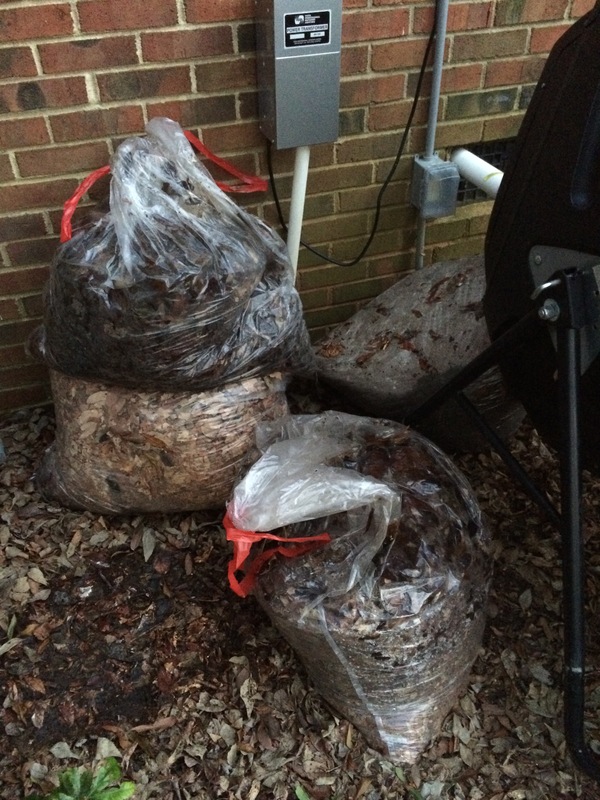 Each year I save a few bags of autumn leaves to turn in to compost later on when compost browns are hard to find. Autumn leaf clippings anxiously awaiting their turn in the Magic Compost-A-Majigger. It’s magic, I tell ya! Alchemy. Your own Black Gold mine right in your own backyard. Have a go! Your veges and roses will thank you for it! Glad I Found your blog! I also started stockpiling leaves this fall to balance next summer’s green bonanza. Hi Dan, I’m so glad you found me! I’m new to this whole blogging thing but keen to connect with like minded people. Do you use a compost tumbler too? Me too! And no I don’t use a tumbler, just 3 plain old compost bins. A tumbler seems lots easier though!